Caption slip reads: "Photographer: Mercurio. Reporter: Ostler. Assignment: Upland Pix layout. 164-41: Upland Junior High students Susan ford and Bonnie Hadley view city's landmark, the Madonna of the Trail, dedicated to the pioneer mothers of the covered wagon days. One of the notables attending the dedication in 1929, was President Truman who at that time was a judge. Monument located on Euclid Avenue and Foothill Boulevard. 10: Workman tony Bermudez of Ettiwanda seen carrying lumber with new housing project in background. 116-117: General view of the City Hall and Fire Department of Upland. 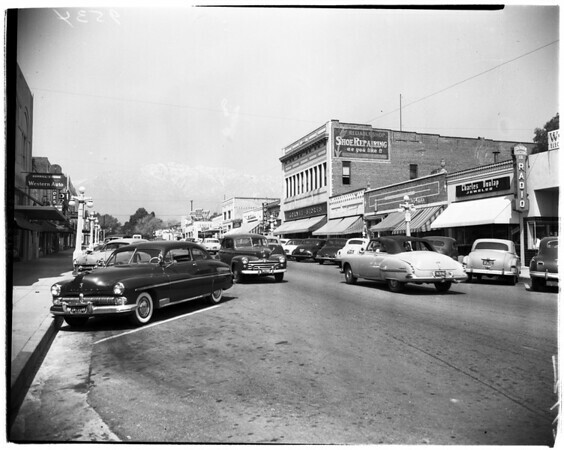 40-114, 113: View of city's main street -- looking north on Second Avenue. 165: Close-up of the monument, 'The Madonna of the Trail'. 7-8: General view of new Subdivision Housing development located just off Euclid Avenue south of Foothill Boulevard. 9: Workman clearing dirt from street with tractor-scraper at new housing project, one of seven currently under construction. 14: Orange grower Gene Nisbet with dog, Trinka, is checking trees and fruit with workman seen on ladder. 13: Orange grove view as seen from top of truck loaded with oranges. 206: Orchard foreman Alfred Tello of Cucamonga checks oranges in boxes. Note: workmen on ladders".